In the 1970s, land owners and tenants across the Highlands were encouraged to ‘improve’ their hill ground with the insertion of open drains across the moors. Substantial government grants were available to cover the costs. Forty years later it is clear that the land did not improve and that the drains simply encouraged erosion of the peat into which they were dug. And peat, we now realise is one of the most important carbon stores in the world – the European equivalent of rain forests. So grants are now available to to reverse the damage which has been caused by putting peat dams into the drains so that water can no longer flow down the drains and erode the peat. 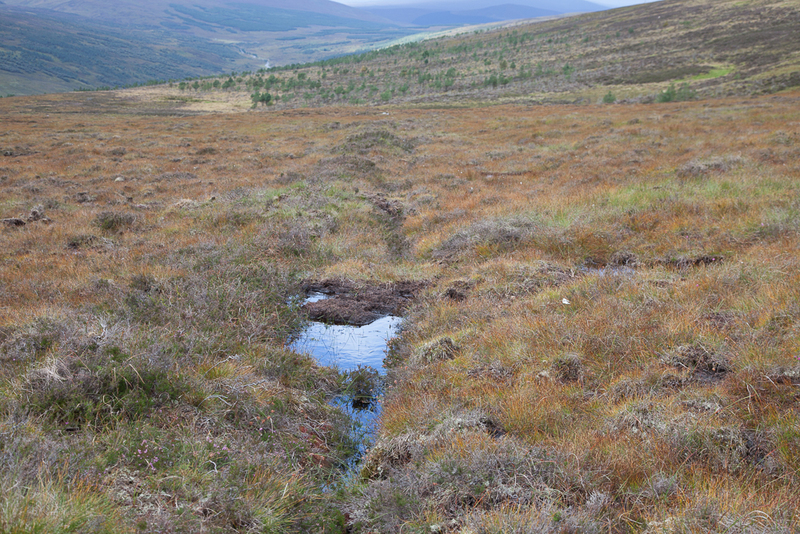 At Croick we must have hundreds of kilometres of peat drains across the estate so with grant assistance we started the process of reversing the damage by inserting dams into 5 kilometres of drains, focusing on areas of steep ground where the erosion process is likely to cause damage most quickly. The picture above shows a new new peat dam holding back water and creating a micro-pond. 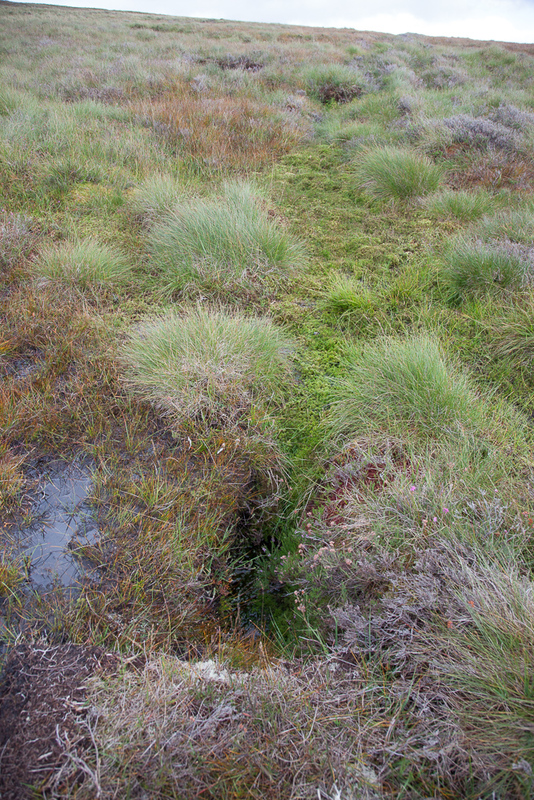 The picture below shows the effect we are looking to create as sphagnum moss colonies the ponds and starts the process of creating new peat. Inserting the dams without causing further damage to the peat in the process is a skilled task and I’m grateful to our contractor, ‘Shy’ John Farquhar, for his work on this over the past few months. It is a small start but gives something on which to build and extend in the future. This entry was posted in Uncategorized and tagged conservation, Croick Estate, farming, peat dams, peat drains, Scottish Highlands, sphagnum moss. Bookmark the permalink. After consideration, I have returned. Lol! I wonder if the people promoting this practice saw it work well in other countries and decided to bring it home, not realising its detrimental effect on peat. It’s not an uncommon thing to see steeper hills ribbed around my corner of the world. The shallow grading of the land stops water from running straight off, giving it a chance to soak in. We don’t have peat here though, and in our sunburnt country, we need every drop of rain to soak in! Australia has had some boo-boos from looking at other countries too. The Cane Toad was introduced from Mexico, which was supposed to eat the Cane Beetle (but didn’t) and Rats Tail Grass, which was supposed to be like cat-nip to cattle (but isn’t) both now run rampage over certain areas in Australia – and getting worse. Hind sight is a wonderful thing isn’t it? I remember Croick before the drains were installed. My father had the fishing rights. After draining – the river Blackwater would not hold much water during a dry spell. The falls pool would be full of salmon and sea trout trying desperately to get up the falls until a part of the rocks on the side nearest the road was blown up in order for the fish to get over the falls. It is so good to know that you are taking such great care of Croick Estate. Croick is a magical place full of beauty and wildlife. Thank you for returning it back to what it once was. Thank you very much for your note, and your memories of Croick. I had not realised that the drains had changed the very nature of the river, but I ought not be surprised. I don’t suppose you have any photographs from those days?